The Twitter Publisher Network was launched so advertisers could run ads not only on the Twitter website and app, but also with the publishers working with Mopub, the ad platform that Twitter had acquired. The first big change that Twitter Audience Platform brings is that it has expanded beyond simply pushing app installs. Now advertisers can also drive two additional objectives: Tweet engagements and video views. Both are now available for the first time in beta to all managed clients globally. The second major change is the addition of new creative formats to help advertisers better engage with their in-app audience. 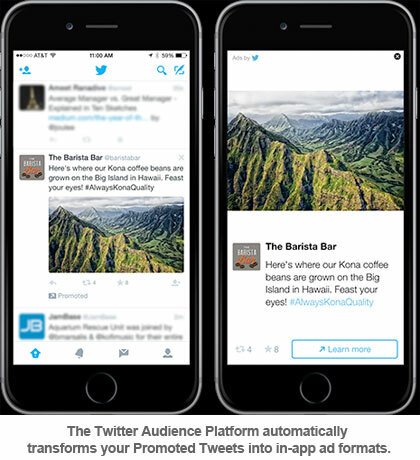 The Twitter Audience Platform is now available globally to all managed clients driving Tweet engagements and video views. To get started, reach out to your Twitter account team. To create a Twitter Ads account, visit ads.twitter.com/getstarted.